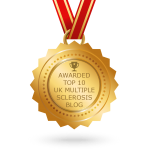 Living with advanced multiple sclerosis. Its all about the ups, downs and graceful falls. I enjoy achieving something. So I am medically retired but hey who cares? I want to work but there are too many obstacles so I do this instead. I will always give things a go, maybe that’s why this website exists. Please don’t be disappointed. I have plenty of grey hairs and bags of enthusiasm; some misplaced. I used to be a computer geek but it was all green screen stuff in those days. Many many moons ago I really struggled to string a written sentence down on paper but I just scraped a pass in English Literature ‘O’ level and English Language ‘O’ level. After science ‘A’ levels I went to Aberdeen University where I was usually in the Red Lounge bar. I hope you enjoy this website, its my medical retirement project. Maybe my stories will help you now, later today, tomorrow or maybe even next week. I do not have any adverts on this website. There are no irritating pop-ups, yes they really do annoy me. Instead why don’t you sign up to receive a regular email, usually once a week. Just go to SIGN UP. I drink weak black tea, no milk my coffee and I don’t add sugar to either. Incidentally I also failed Latin ‘O’ Level but so what. Aid4disabled is all about my journey with MS since medical retirement.